I remember those mud slides and the problems they caused. At least you had the first visit, and those wonderful images to remember it by. The sunlit cliff is my favorite, but I couldn’t help noticing how the rock swirls resemble flowing mud. 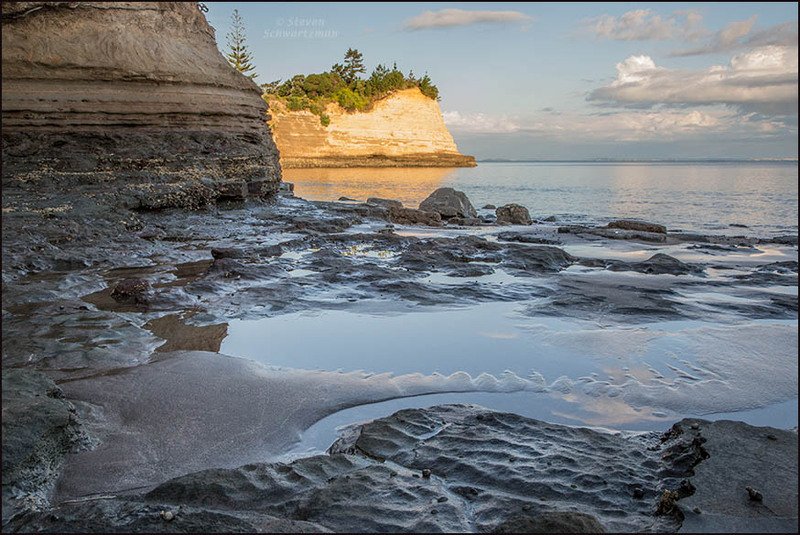 Funny, I hadn’t connected those swirls in the once-molten rock to the moving mud that trapped us on the Coromandel Peninsula. Now that you bring it up, they sure are emblematic of our problem. I’m glad I took enough pictures at Little Manly Beach that even on this third go-round of showing patterns I found some not so similar to any of the previous ones as to be repetitious. I certainly found the place marvelous, which is why I’d hoped to go back. Maybe they’re emblematic of my brain. I like the first, late afternoon shot, it looks calm and idyllic. I would go back there! I would indeed go back if the chance presents itself. And for everyone who hasn’t visited New Zealand, the many pictures that have appeared here should act as an enticement. Inspired landscape (what depth) and nature abstracts. Your mention of depth sent me looking at the metadata, which showed a focal length of 35mm (on a full-frame sensor) and a tiny aperture of f/18. Although I don’t remember choosing those settings, it seems I took into account how close the beach at the bottom of the frame was and how far away the illuminated bluff was, and must have gone for maximum depth of field. It worked, I’m happy to say. As for abstracts, they’re among my favorite things to do. 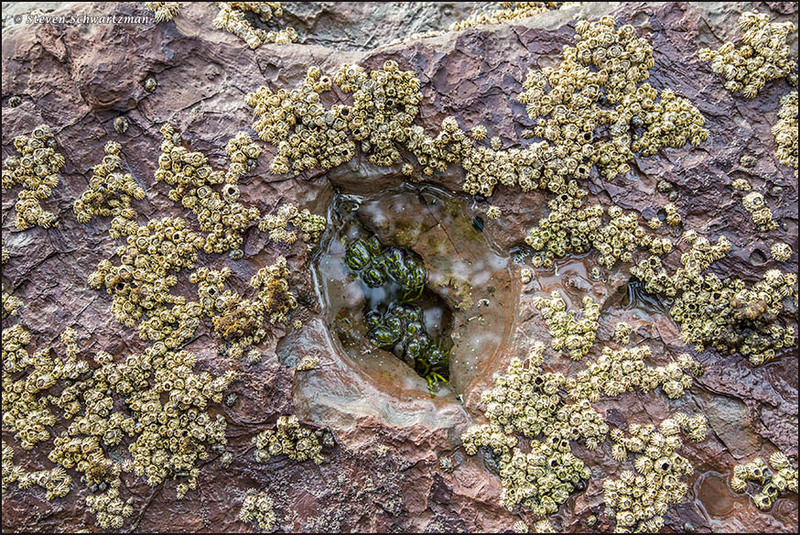 Wonderful lead landscape image, Steve, and your nature close-ups are gorgeous – especially Rock Swirls. New Zealand is spectacular, isn’t it? It certainly is, enough to warrant two trips just two years apart. You’re the third commenter to mention the opening landscape image that I included to set the scene. I didn’t do that in my original series of postings about this place in 2015, so I’m glad I did now, especially given the positive reaction. Beautiful photos Steve. 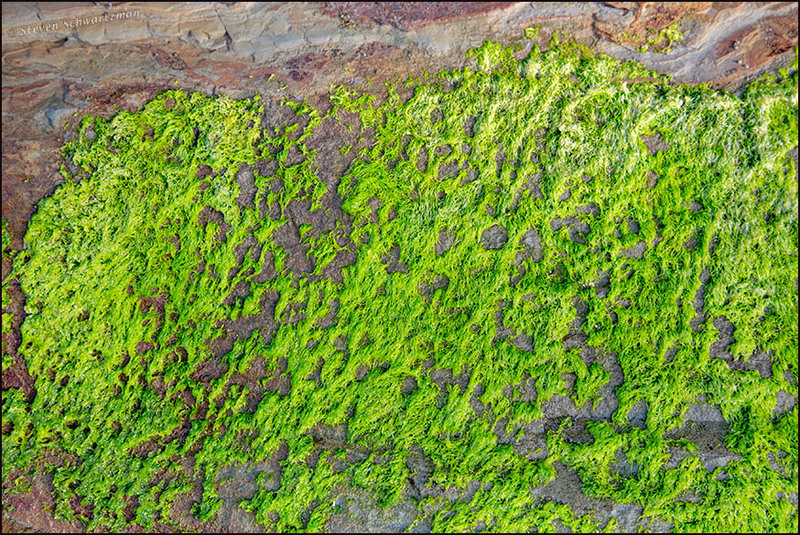 We get so used to our volcanic landscapes, coastal rock pools, etc. At least, when I lived up in Auckland I did. I appreciate their beauty more nowadays, now that I live in the far south of NZ. It sounds like some more trips back north would suit you now, just for the variety. I found at least some good things everywhere I went in New Zealand, and not always in the best-known places. Little Manly Beach, for example, proved one of my favorite places, even though I have the impression it’s not especially well known. You do textures so well Steve! Thanks, Maria. I think you’d have done so too, had you visited this beach. All naturals disasters are a shame and it’s too bad one happened during your visit. 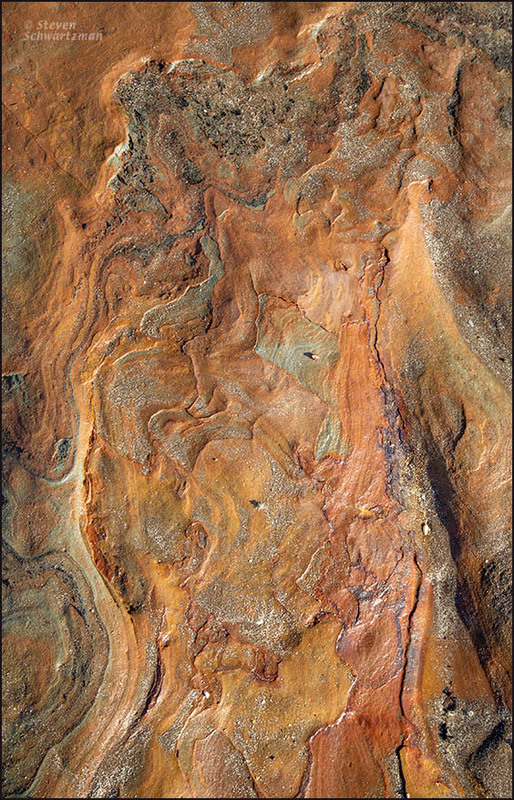 The rock swirls are very nice and a great study of the textures we can find in solid objects. The coastal highway was damaged and still remained closed at the time of our second visit. That meant that when we left Gallivanta’s place in Christchurch and headed for the ferry to the North Island we’d have to detour several hours out of our way. The night before our departure from Christchurch a forest fire threatened the detour highway, and it looked like we’d have to drive all the way over to the west side of the island and add several more hours to our trip. Fortunately by the next morning we were able to get through on the “normal” detour route, though we saw work crews still putting out hot spots along the road. The locals may want to pay you to visit elsewhere. I get the feeling that New Zealanders are used to natural disasters. Have you ever been to Little Manly Beach in Whangaparoa? I think so Steve, but it was years ago ..
Then maybe it’s time for a return visit. In addition to Little Manly Beach we took the ferry over to the reserve on Tiritiri Matangi Island, which I’d also recommend.